Mexican beach pebbles are smooth landscape stones that can be installed wither by pouring or one-by-one by hand. Typically the smaller sizes (up to and including size 2-3" pebbles) are poured to achieve a 2-3 layer look. Anything bigger (3-5" beach pebbles and up) are installed by placing each individual stone in its place. The resulting look is a single-layer cover about 3" thick. How Deep Should I Go With My Beach Pebbles? The most eye-pleasing, high-end look with Mexican beach rock is one whereby nothing shows through and pebbles are installed in a uniform manner. Smaller size pebbles are also thinner, which is why they need to be placed in several layers to create a "filled in" look with no gaps. This will also help ensure that no weeds and unwanted vegetation grows through. Additionally, a thick landscape fabric or other type of barrier should be placed underneath beach pebbles to ensure that they stay put and require almost no maintenance (apart from blowing off debri and leaves, and washing with water once in a while). With larger beach stones, one-by-one installation means that you can create various mosaic-type looks. This can be done by choosing beach pebbles of two or more contrasting colors (for example, buff ivory beach pebbles and grey pebbles) and placing them strategically to create lines, squares, circles, and other types of figures. 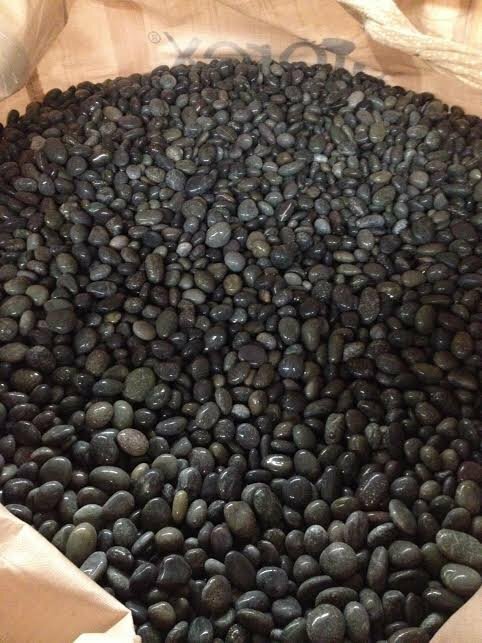 Since Mexican river rock is smooth (even in large size pebbles), size 3-5", 5-8" and larger landscaping stones can also be placed next to pools and used to cover walkways where people might walk barefoot. Larger sized stones can be secured in place by using simple adhesive and landscaping cloth. Once secured, they will stay put due to the adhesive and also the sheer weight of stone keeping it put. How Do I Know How Much Landscape Stone to Order? While coverage for smaller size Mexican rock is rather standard (for example, in size 1-2" one 3,000-lbs super sack covers 150 sq. ft.), it can be tricky to figure out coverage for large Mexican beach pebbles (beach boulders). The amount you need will depend on the type of use: for example, if you want to create a uniform ground / walkway cover, you will need more landscaping pebbles than if you want to use large pebbles as walls for a dry river or to intersperse with smaller pebbles or some other type of ground covering. We can help you figure out how much material to order: just let us know what type of project you are working on, and the approximate dimensions. In addition, even if you come up short, we can always get you more beach pebbles since we operate our own pebble beaches in Mexico.